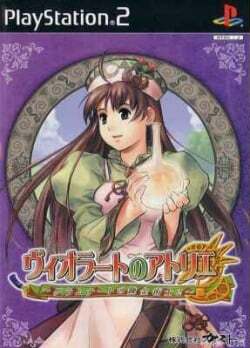 Game description: Violet no Atelier is the 5th release in the official Atelier series, the successor to the Judie no Atelier: Gramnad no Renkinjutsushi series, and the final game in the both Gramnad series and wider "classic timeline". It was also the last of the "classically"-styled, run-an-Atelier-and-focus-on-item-crafting type Atelier games released until Atelier Lisa and Atelier Rorona. The game takes place about 20 years after the events of its predecessor Judie no Atelier, and about a year after the end of Atelier Elie. On a peninsula to the south west of the continent Gramnad, there is the Kingdom of Kanalland. Here, there is a small and underpopulated village by the name Karotte Village. The main protagnoist Violet lives there with her family, although her parents are leaving Karotte Village. Violet, however, refuses to leave. After a dream, the game begins with Violet being woken up by her brother Bartholomaus. Bartholomaus tells her that today is the day that their parents will leave. Violet is very confident about her idea to open up a shop in town, even though her father doesn't support her idea. Their parents will return in three years, and see how the siblings are doing. Until then, Violet will need to prove that she can run her own shop. This page was last edited on 16 April 2019, at 01:40.